CABLE HIGHLIGHTS: Game 7 of the Boston vs. Washington NFL PLAYOFFS gave TNT a resounding win for the night at 2.70. Compared to that, even the 1.18 for VH1’s LOVE & HIP-HOP (down a tenth from last week) looked wan, and the rest of VH1’s line-up had BASKETBALL WIVES steady at 0.92, and TI & TINY at 0.76/0.73, compared to last week’s 0.55 for a DEAR MAMA special. USA’s WWE telecast was at 1.02/0.96/0.94 compared to last week’s 0.96/0.96/0.86. Discovery’s STREET OUTLAWS fell 0.19 from last week’s 2-hour episode to 0.89, and VEGAS RAT RODS returned at 0.42. Although it was far below basketball, NBC Sport Net’s NHL PLAYOFFS game was still substantial at 0.67. AMC’s BETTER CALL SAUL slipped 0.02 to 0.63. On MTV, TEEN MOM rose 0.04 to 0.60, and the AFTER-SHOW was up 0.03 to 0.32. Bravo’s SOUTHERN CHARM dropped 0.05 to 0.48, and SOUTHERN CHARM SAVANNAH ticked down to 0.26. 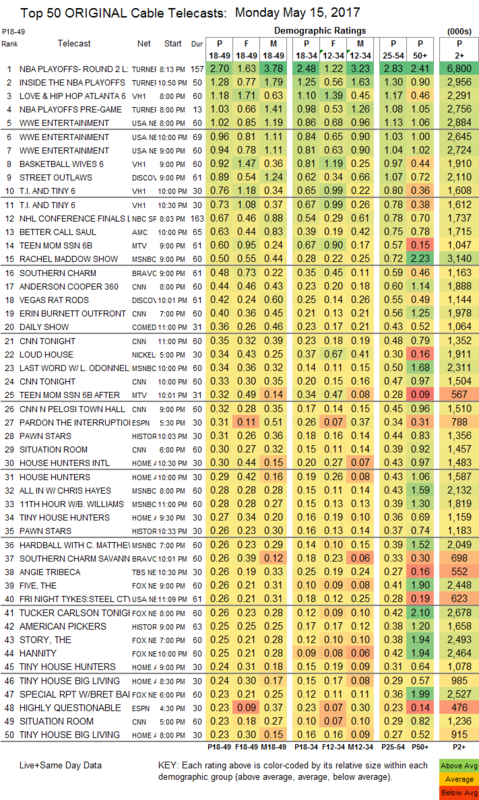 History’s PAWN STARS was at 0.31, compared to last week’s 0.26/0.25, and AMERICAN PICKERS was down 0.03 to 0.25. HGTV’s HOUSE HUNTERS INTL and HOUSE HUNTERS were at 0.30/0.29, compared to last week’s 0.32/0.28, and TINY HOUSE BIG LIVING was at 0.24/0.23 compared to last week’s 0.20/0.19. 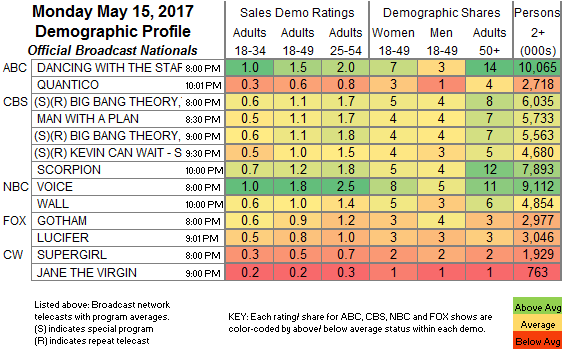 On Freeform, BABY DADDY gained 0.02 to 0.22, and YOUNG & HUNGRY ticked down to 0.19. Food Network’s KIDS BBQ CHAMPIONSHIP climbed 0.04 to 0.19.